Mexican Avocado Cotija Dip It’s guacamole, but kicked up a couple notches, making it an impressive and fancy dip that’s perfect for entertaining. 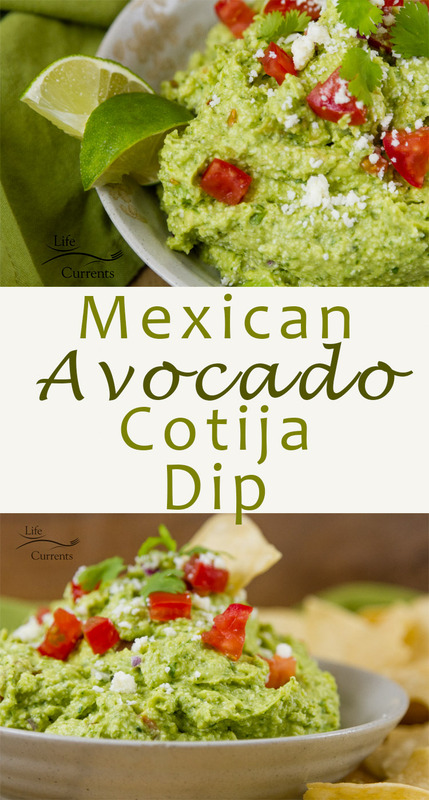 This Mexican Avocado Cotija Dip is so good! A nice salty, but not overpowering, flavor from the Cotija cheese, balancing the creamy avocado. It’s guacamole, but kicked up a couple notches, making it an impressive and fancy dip that’s perfect for entertaining. This dip was inspired by a conversation with a friend of mine. He told me how he loved a dip I shared on Facebook that was made with Feta and avocado. We decided that I needed to come up with my own version. And, as I developed a recipe based on what we talked about, I realized that I could make two versions of the same idea. One with Mexican flavors like Cotija and cilantro, and the other with Mediterranean flavors like Feta. So, I’ll be bringing you a Mediterranean dip soon! When I went to buy the Cotija cheese, a crumbly, dry, salty, Mexican cow’s milk cheese, similar to Feta, my husband noticed that it was spelled differently than we thought. I did a little research, and turns out, “cojita” is incorrect. It should be “cotija. Apparently “cojita” means “small female cripple”. OH! Well, I learned something as well as making a tasty dip! Serve this Mexican Avocado Cotija Dip with chips, pita chips, veggies, or crackers. I also plan on topping tacos with it. And, I think it’ll be great as a sandwich spread. Place the Cotija, cilantro, olive oil, garlic powder, salt, and pepper in the bowl of a food processor or in a blender. Blend until well combined and all chunks are small. Add the avocado, and pulse until smooth (some small chunks of avocado are fine). Place avocado mixture in a bowl, and gently stir in chopped red onion and half of the chopped tomato (reserving the remainder for garnishing). Place dip in a bowl, garnishing with remaining chopped tomato, additional cotija, and cilantro leaves if desired. Serve with tortilla chips, pita, veggies, or crackers. Oh man you had me to cotija, I love that cheese. This would be a great taco topping, I’m so sad avocados give me tummy ache! I love your idea for a mediterranean variant though. This Mexican Avocado Cotiji to do on my list now, thanks for sharing this recipe.